Daniel, the painter who Wes Bentley portrays in The Time Being, at first creates a series of cold, emotionally stunted artworks that aren't exactly flying off the walls at his exhibitions, something shared in common with Nenad Cicin-Sain's film itself. Each pieces that the artist creates has his blood, sweat, and tears crammed into the intricacy of their shading and quasi-realism, derived from abstract reference photos and restrained in palette to convey his desired aesthetic. Despite their beauty on the surface, however, there's something resistant and conflicting within each one, where you're able to grasp their intended purposes without feeling the gravity towards them that he'd like to deliver. The same can be said for The Time Being's exploration of troubled creatives themselves: it conveys the painter's inner turmoil as the output of his talent isn't selling and he resorts to another abstract commission to put food on his family's table, but its sparse, drab emotional tempo and muddled domestic drama doesn't invite others to take its musings down off the wall. While struggling with the decision of whether to plug forward with his same artistic ideas or switch things up, Daniel (Bentley, There Be Dragons) accepts an offer from one of his sparse patrons to hand-deliver the work that the man purchased, hopefully suggesting that the buyer might be interested in other commissions. This ends up being true, but not in the way Daniel was expecting: Warner Dax (Frank Langella, Robot and Frank), an elderly dealer in vague commodities with a sharp, chilly attitude, asks him to videotape a specific sunset at a certain time and place. Daniel cautiously accepts out of financial desperation, despite cinematography not being his profession, which starts a series of jobs that escalate in their obscurity, eventually moving to shots of children playing on a jungle gym and of a museum. This also pulls the artist away from his other work and his part-time gig at an art-supply store, leading to an odd focus on Warner's agenda as his other responsibilities -- namely as a husband and father -- quickly degenerate with his new documentarian position. If The Time Being were judged purely on its visual merits -- its encapsulation of a voyeuristic approach to the artist's struggle -- then it would be a considerably more successful film. Distanced shots from Daniel's painting spaces capture the fluctuations in his composure as he operates within them, while close-ups on Wes Bentley's inherently concerned and despondent features create absorbing images as he doles out globs of paint to be stroked, mixed, and dabbled. The cinematography's composition also tries to express the mental state of the characters outside of Daniel's work areas, from shots of his wife reflected in mirrors and in the shower to Warner's detachment in the confines of his home. Criss-crossing phone lines, ripples in bodies of water, and rays of sunlight peeking out from clouds are all engaging to the eyes, brushing against the idea of a painter's perspective being reawakened through unlikely circumstances. This visual potency ends up playing a key role in the film's grand, effectively melodramatic apex, once it's revealed how Warner ultimately uses the footage that Daniel captures. When placed alongside the script for The Time Being, however, its imagery rings hollow against the film's dour and lethargic exploration of art and the artist's psyche, coming across as emotionally static and lacking the substance to support its otherwise admirable intentions. 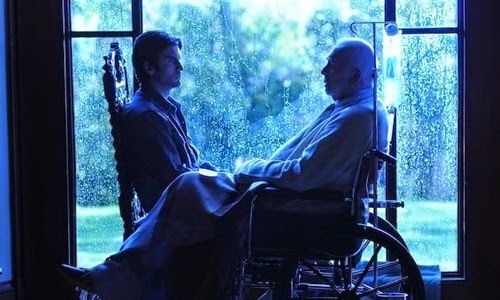 Despite a low-rumbling performance from Frank Langella that attempts to elevate the film's pathos, the old man's demanding bitterness never feels justified as he continues to ask Daniel to reach beyond his comfort zone. The reasons behind his isolation and motivation towards asking this painter to capture specific things outside his house is entirely unsurprising and more than a little dramatically rigid, thus causing the film's flickers of mystery to slump about halfway through. Alongside that, Daniel's life seems to spiral out of control entirely too quickly during his short, broken-up handful of commissions for Warner, serving only to escalate the drama -- bringing the artist closer to a state of solitude, a theme discussed between he and Warner -- without the rationality to back them up. At its core, The Time Being focuses on Daniel's rediscovery and restructuring of his artistic perspective in response to Warner's overarching "commission", and being trapped in that dark, inert mental space isn't something that Wes Bentley excels at. As I mentioned earlier, his quieter scenes without dialogue work well with his intense gazes and transformative facial and body expression, but his presentation of the character's stiff introverted personality and neglectful domestic inclinations detract from the film's genuineness. That may be part of his role, but he's oddly dissatisfying to watch in scenes that should reveal more emotional vigor than he's able to muster within Daniel, despite the American Beauty actor's capabilities with similar roles. It's a shame, too, because there's something faintly absorbing about seeing where the artist's paintings start and finish after his experiences with Warner, how the elderly man's underlying intentions with the footage manifest into an expression about the love for one's family. However, there's simply not enough tangible dramatic growth and too much reliance on drawn-out visual lyricism to appreciate the plunge Daniel takes across Nenad Cicin-Sain's freshman feature.